The Lunder-Dineen team extends a big welcome and thank you to all participants who enrolled in the launch of the premiere, statewide Maine Nursing Preceptor Education Program. 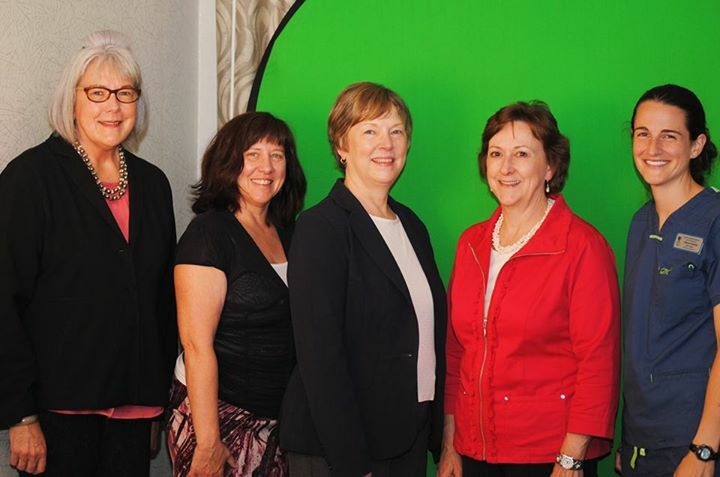 Pictured here are members of the statewide program advisory team including Karole Johnson, MSN, RN; Su Sepples, PhD, RN, University of Southern Maine; Gloria Neault, MSN, RN, MaineHealth Learning Resource Center; Sherry Rogers, RN, MSN, NEA-BC, Redington Fairview General Hospital; and Allyson Koenig, RN, BSN, Maine Veterans' Homes. The free program, which officially started on September 16, is a blended learning program that includes easy-to-use online modules and a one-day live workshop designed for experienced, direct care registered nurses in Maine who are interested in becoming preceptors. We are pleased to report that there are more than 150 registrants in the Fall 2015 program. The importance of nursing preceptorship programs is critical to Maine and the health care landscape throughout the state. 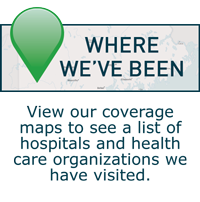 RNs between the ages of 52 and 71 comprise more than 47 percent of the nursing workforce in Maine, with 52 percent not planning to remain in the workforce five years from now. This demonstrates an immediate need for quality precepting as a tool to prepare, transition, and retain new and transitioning nurses. This program provides preceptors with the knowledge, skills, and abilities to guide and support new nursing graduates, nurses transitioning to new roles or positions, and nursing students. Our team is also thankful for the dedicated effort and guidance of our pilot advisory team, which is comprised of members from Maine Partners in Nursing Education and Practice, Organization of Maine Nurse Executives (OMNE), representatives from nursing academia, acute care, long-term care settings, and emerging nursing leaders in the state. To learn more about the program, visit lunderdineen.org/preceptorship. 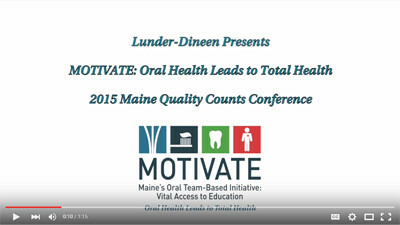 Lunder-Dineen presented a session on MOTIVATE: Maine's Oral Team-Based Initiative: Vital Access to Education during the 25th Annual Maine Geriatrics Conference in Bar Harbor this past June. The session provided an in-depth look at the framework behind the MOTIVATE initiative and allowed attendees to consider both the value of establishing collaborative partnerships and the potential impact of MOTIVATE on improving the oral health and overall health of long-term care residents in Maine. Speakers included Lunder-Dineen executive director Labrini Nelligan, MS, and Maine-based MOTIVATE advisory team members Jennifer Crittenden, MSW, Assistant Director, University of Maine Center on Aging; Demi Kouzounas, DMD, immediate past president of the Maine Dental Association and practicing dentist in Scarborough; and Timothy Oh. DMD, FACD, FPFA, FICD, current president of the Maine Dental Association and Director, Caring Hands of Maine Dental Center. Watch a highlights video of the presentation. In preparation for National Dental Hygiene Month in October, participate in this session that was presented at the 23rd Annual Maine Geriatrics Conference. The senior population in the United States is increasing at an unprecedented rate. As they face challenges from diminished health and resources, the number of vulnerable elderly will increase. Currently, according to the research of the Robert Wood Johnson Foundation, the greatest unmet health need in older adults is oral health care. The goal of this session is to discuss this challenge and focus on the interface of oral and systemic care in vulnerable elders, and the obstacles that seniors face in seeking oral health care in Maine and nationally. 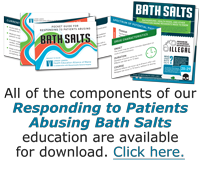 This session is intended for registered nurses, physicians, and physician assistants.